WASHINGTON (AP) For brothers Alexander and Mischa Zverev, this was, in many ways, just like many another day on the professional tennis tour: They warmed up together at a tournament. The difference on Thursday at the Citi Open, where Alexander is the defending champion and seeded No. 1? For the first time after one of those practice sessions, the two Zverevs faced each other in an ATP main-draw match. Seems safe to say Alexander has never hugged an opponent quite the way he did No. 15 seed Mischa after beating his older sibling 6-3, 7-5 to reach the quarterfinals at the hard-court tuneup for the U.S. Open. And Mischa has never beamed after a loss quite the way he did on this occasion – or dealt with the emotions he experienced beforehand. This was not quite Zverev vs. Zverev for the Wimbledon trophy, as the two Germans had first dreamed about a decade or so ago. Still, it was a unique moment, with their father, Alexander Sr. – the man who taught both how to play tennis and coaches them to this day – sitting in a front-row seat in a corner of the stadium. Their mother was in the stands, too. ”I just enjoyed it out there,” Alexander said. The day began with a rain delay of about 3 1/2 hours, and by the time everything wrapped up just past 3 a.m. on Friday, three-time major champion Andy Murray had won his third consecutive three-setter, 6-7 (5), 6-3, 7-6 (4) over 93rd-ranked Marius Copil, and sobbed into a towel afterward. They hadn’t started until midnight, and Murray complained afterward about how it will be impossible to recover in time for his quarterfinal Friday. Murray, who is working his way back into shape after having hip surgery in January, is to face 19-year-old Alex de Minaur next. The other quarterfinal matchups are Alexander Zverev vs. No. 7 Kei Nishikori, who defeated No. 9 Denis Shapovalov 7-6 (1), 6-3; No. 3 David Goffin vs. No. 10 Stefanos Tsitsipas, and No. 16 Andrey Rublev vs. Denis Kudla. No. 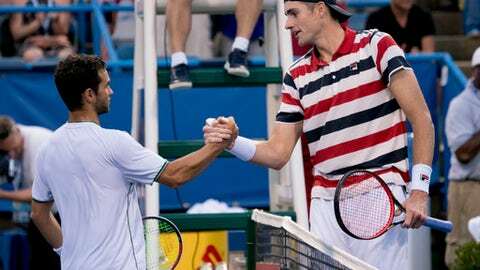 2 John Isner was eliminated 6-4, 7-6 (6) in the second round on Thursday by Noah Rubin, who then had to go out and play another match, which he lost to Rublev. The Zverevs had met twice before in qualifying matches, most recently in 2014, but never during the real rounds of a tournament. Their match Thursday was the first between brothers on tour since Gerald and Jurgen Melzer played two years ago. The dynamics were a bit different from a usual match. The Zverevs know each other’s on-court strengths and weaknesses so well. There wasn’t much emotion from either. And not much cheering from spectators, who maybe had a hard time picking which one to pull for. Instead of using simply a last name to refer to a player, the normal practice, the chair umpire used first names, too. As in: ”Game, Sascha Zverev,” using Alexander’s nickname. The most interaction between the siblings came during a 15-minute rain delay in the second set, when they exchanged a few words about whether or not play should resume – and then when the last point arrived. Alexander hit a short shot that Mischa chased but put into the net. Mischa continued around to the other side and walked up to Alexander for a lengthy embrace. They shared some words, then walked off the court together, and Mischa grabbed Alexander by the scruff of the neck. Alexander is ranked No. 3, Mischa No. 42. Alexander is a righty, Mischa a lefty. Alexander is 6-foot-6 (1.98) and prefers baseline exchanges, while Mischa is 6-foot-3 (1.91 meters) and likes to go to the net. While there have been some famous sets of siblings in tennis – the Williams sisters and McEnroe brothers come to mind immediately, of course – it is rather rare for two people from one family to reach the highest level of any professional sport. Consider this: When each Zverev reached the third round at the French Open in June, they were the first pair of brothers to make it that far in Paris in 39 years. Occasionally, they team up for doubles, and they did so Thursday after their head-to-head matchup. The Zverevs went to a different court and traded high-fives and fist bumps along the way to finishing a rain-interrupted 6-1, 6-4 victory over No. 1 seeds Oliver Marach and Mate Pavic.